This level has easy difficulty. For this level trey to play near to icing blockers and make special candy. 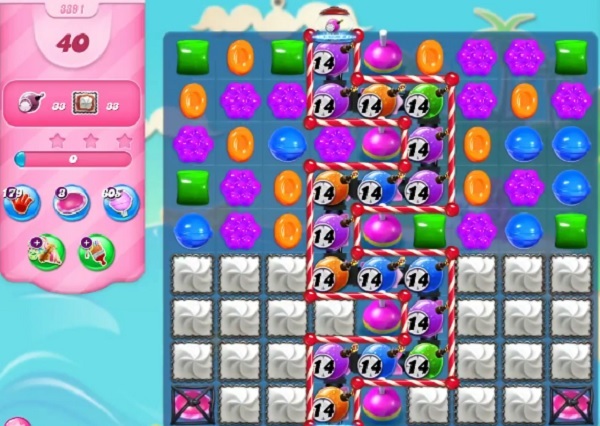 Use more striped candy with other special candy to break the time bomb and other blockers. Yep same here. Complete joke!!!!!!! Same here. Only 13 Moves!! Have 13 moves, would appreciate your help & co-operation. Thanks for listening. Games aren’t even fun anymore – I think I’m finally going to have to quit playing! Ik heb maar 13 zetten en in voorbeeld 40 dat is wel een verschil !!! Controleer is wat beter.hier kom je nooit doorheen. Are u serious CC? 13 moves to your 40. What ru doing? This is another new low. I thought u can’t get any lower, but u did. If u can’t fix the fixable, then what ru here for? U are cruel and unfair. Incompetency is running amok there. Your favor ability is way down in the negatives. U are in such a dark hole, light can’t reach u. Do the right thing and fix this abomination. not fair…again you show 40 moves and we have 13. please help me. I enjoy this game but lately it is so frustrating. Help! 40 moves, I only have 13! Once again another frustrating level that needs fixing! I only get 13 moves. How come??? This is impossible with just these few moves when yours show 40 moves. Ridiculus!!!!! I am really tired of complaining about your inconsistencies. If you would only make your game and your examples match. We have 13 moves and you show 40. What is with that? Please , please pay attention to what you are doing. We obviously love the game if we are on episode 3391 but I speak for myself and I’m sure others when I say. “I am fed up” Can you fix this before I finally quit completely!!!! Mom I have 13 moves. I need a lot of help please.